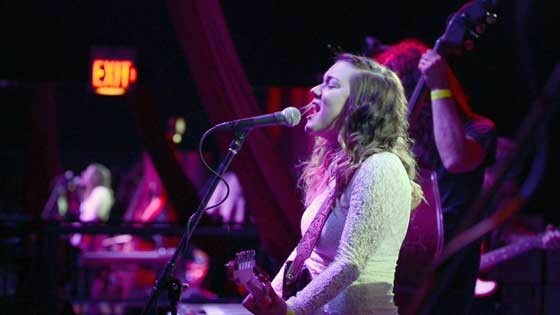 Rather than taking a reverent look back at an established artist, Bechard’s new film serves as an introduction of sorts to a musical life in progress, diving deep into the evolving career of a gloriously foul-mouthed former Ohio farm girl and the bandmates behind her. Lydia & co. may be on a familiar and oft-repeated journey––from tour van to rock club to recording studio and repeat––but theirs is a singular version thanks to the talented, charismatic woman at the wheel. Though the movie spends some time on Loveless’s past, from her musical upbringing to her younger days in family-filled bands, its focus is on the now: recent footage from a fierce, frenetic live show mixes with a revealing peek inside the studio as the quintet works on their next record. Interspersed are candid interviews touching on issues that many bands face, including the tricky economics of being a working musician, and sexism in modern-day music media. Lydia’s blunt, incisive responses and her band’s special take on what she calls “indie-alt-country” may help answer the question posed by the title, but you’ll leave wanting hear more songs and find out for sure.